December 18, 2017 at 3:50 pm. KICKOFF: Monday, 8:30 p.m. ET, Raymond James Stadium. TV: ESPN, Sean McDonough, Jon Gruden, Lisa Salters (field reporter). SERIES HISTORY: 49th regular-season meeting. Series tied, 24-24. Atlanta won the first game this season, 34-20, as Julio Jones tallied 12 catches for 253 yards and two touchdowns. Since the NFC South was born in 2002, Atlanta leads the series 16-14. The teams split in 2016, each team winning on the road. KEYS TO THE GAME: This is the first — and easiest — of three straight division games as the Falcons pursue a return to the playoffs. With New Orleans and Carolina looming, a win vs. Tampa Bay seems paramount. The Falcons faced Ryan Fitzpatrick in the previous meeting, but Jameis Winston has returned from his shoulder injury and offers a different challenge. “Jameis adds that element of the unknown because you never know,” Falcons free safety Ricardo Allen said. “He makes some big plays sometimes on plays that are not scheduled, plays that you can’t really draw up, plays that you can’t really design. The Bucs have to try to continue to play more ball-control offense than in the past. That’s because they are protecting a defense that cannot rush the passer. The Bucs have had some success in the running game the last two weeks, especially with Peyton Barber. They also have gone heavy in the screen game to protect a beat-up offensive line. Defensive tackle Gerald McCoy has a biceps injury and may not play. The Bucs simply can’t get home with rushing four, so they will have to mix in some blitzes if they can get the Falcons into predicable passing downs. Matt Ryan and the Falcons will want to be careful with the ball. Lavonte David has forced five fumbles and the Bucs intercepted Lions QB Matthew Stafford twice last week. 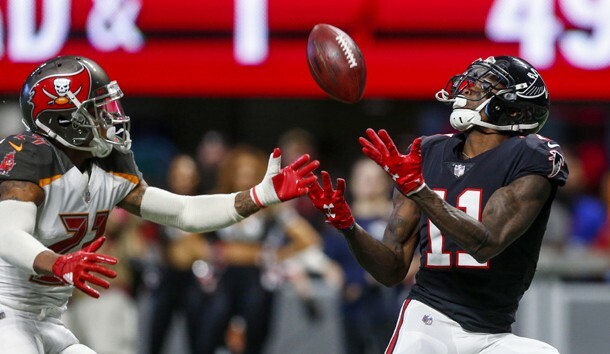 –Falcons WR Julio Jones vs. Bucs CB Brent Grimes. Bucs defensive coordinator Mike Smith said he tried 14 coverages on Jones last time and none of them worked. But he never tried to let Grimes follow Jones all over the field. That will be interesting if the two are left to go one-on-one. –Bucs WR Mike Evans vs. Falcons CB Desmond Trufant. Evans has only four catches for 58 yards in the past two games. Teams have been keeping a safety over the top. He also has struggled to catch the football. Trufant had to leave the first meeting this season with an injury, but he is a shutdown cornerback. PLAYER SPOTLIGHT: Falcons RB Devonta Freeman. He did not play in the previous meeting, out with a concussion. Now Tevin Coleman is in the concussion protocol and Freeman will carry the load against the Bucs, who have given up 14 rushing TDs this season. FAST FACTS: The Falcons are 8-0 when scoring 20 or more points in 2017. … In his past three games vs. Tampa Bay, QB Matt Ryan has 995 passing yards (331.7 per game), seven TDs and no interceptions. In his past eight Monday games, he has 2,367 passing yards (295.9 per game), 17 TDs and five INTs. … RB Devonta Freeman rushed for 91 yards and a TD last week. He has gone over 100 total yards in his past two games vs. Tampa. … WR Julio Jones is tied for first in the NFC with 1,161 receiving yards. He has 375 yards and two TDs in his past three contests. He caught 12 balls for 253 yards and two scores in the last meeting. … LB Vic Beasley Jr. has 11.5 sacks, four forced fumbles and a fumble recovery in his past 11 on the road. … LB Deion Jones tied a career-high with 13 tackles and picked off a pass last week. He is one of four NFL players with 100 tackles (109) and two INTs (2). … Tampa Bay QB Jameis Winston has 542 passing yards (271 per game), seven TDs and one interception in his past two games vs. Atlanta. He is averaging 290.3 passing yards in his past four home games. … WR Mike Evans is on pace for career lows in catches (68) and yards (935) and his four TDs are eight fewer than he had last year. In his past three home games vs. Atlanta, though, he has 23 catches for 336 yards and four TDs. … WR DeSean Jackson has 690 yards (115 per game) and three TDs in his past six games on Monday. He has 100 or more yards in five of his past six Monday games. … TE Cameron Brate has 14 receiving TDs since 2016, tied for second most among NFL tight ends. He has six touchdowns this season, but only two have come in the past six games. … LB Lavonte David led Tampa with 14 tackles and forced a fumble and recovered last week. He leads the NFL with five recoveries and ranks second with five fumbles caused. Since entering the league in 2012, he is the only player with 700 tackles (748) and 15 FFs (17). PREDICTION: Even with Winston back, the Bucs are not good enough to challenge a Falcons crew driving for the playoffs.